The St. Francis de Sales Choir is a 25+ member group of singers dedicated to providing the finest choral music for worship at our church, carrying on a deep tradition of sacred music in our parish that stretches back to the 1920s. Throughout its history, the Choir has fostered a strong sense of community within its members and a commitment to sustaining the unique gifts and characteristics that make our Parish such a special and inspiring place and an “anchor and beacon” for this neighborhood. We sing challenging works — but you do not have to read music or have a musical background to participate (many in the choir can’t read music). As the choir’s director since 1997, Isabel Boston conducts, selects choral music and hymns, assigns cantors, and provides music for holy days throughout the liturgical year. An avid chorister since the age of 9, Isabel grew up in a music conservatory run by her father, Joseph Prendergast, where she cultivated a life-long interest in classical music. 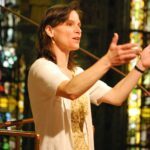 She joined the choir at St. Francis de Sales in 1989 and has sung with a number of vocal performance groups ever since, including Ancient Voices, an ensemble at the University of Pennsylvania, directed by William Parberry specializing in early music. Her husband, Rod Boston, sings in the choir’s tenor section. Organist Bruce Shultz formed the present all-volunteer choir of mixed voices in 1975. Many features of the music program bear his influence: his original “Mass for John Paul II” is a regular setting of the Mass at St. Francis de Sales. The De Sales Choir undertakes an inspired and distinctive repertoire covering ten centuries of Christian sacred music. From Gregorian chant to American spirituals, from Renaissance polyphony to masterworks from Handel, Mozart and Brahms to modern composers, we try to bring works of the highest quality and most profound religious beauty to every service we perform. A conservative estimate is that we have over 300 works in our repertoire, and we add to that each year. We organize rehearsals to assure that everyone, at every skill level, can learn the music. We also post digital recordings of “rehearsal helps” on the Internet to help members learn. 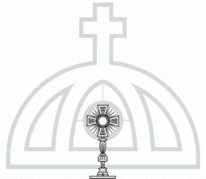 We serve the 10:15 Mass every Sunday from September through the end of June; we also sing at Christmas Midnight Mass, Christmas morning, and throughout the Easter Triduum.